We received products and/or other compensation to facilitate this post but all opinions shared are our own. I’m always looking for new ways to make reading fun and engaging for the kids. 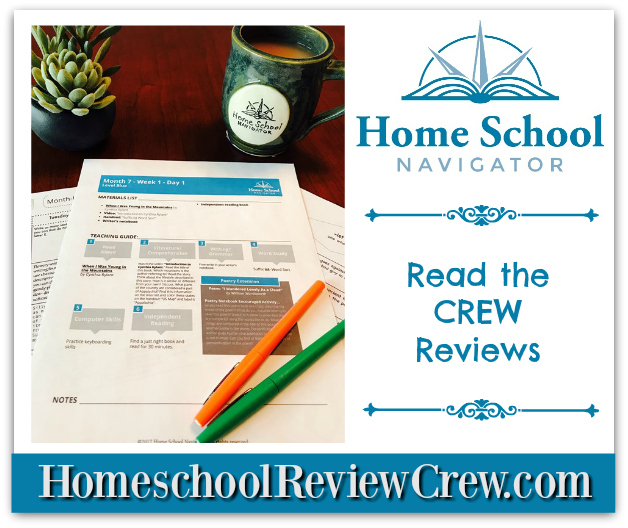 Home School Navigator is a new site to us and different than anything I have previously encountered. It’s set up to explore language arts in an easy to follow guide. Each lesson has a week and day planned out for a full day of reading, writing, and language building. There are different levels to use based on the skill level of your child. Kindergartner is on the red level, Tween is doing the Blue level, and Teen is working on the Indigo level. I was able to preview all the different levels to figure out the one that worked best for each kid. Each month comes with a printable pdf guide to follow. It gives you the book that they will be studying as well as any other materials you might need.Here is a small preview of the Indigo level lesson plan. Each month is split into lessons for easy browsing. They just click the week and day they are working on and all the day’s work will be laid out for them to get started. When they click on their lesson, they will go to a screen where they can read what they are supposed to do that day. Often there is a video or printable work page included. At the end they can submit their work to you or store it online and mark complete. I was a little worried if we were going to be able to find all the books on their required books list but most of them have a read a long video where they read the book to the kids and these books are popular books that should be easily found at the local library. These videos are quality made and very interesting for the kids. Lou Lou has enjoyed watching these videos and doing the fun activities that come along with the Red level. They have games, and other fun educational printables that go along with the books for them to print. Another interesting part of Home School Navigator is the Interactive Notebook Book Studies. The one we did was about the book Holes by Louis Sachar. This book was really easy to get a hold of and both the older kids really enjoyed it. All you need to set up these fun educational notebooks is the printable pack, scissors, glue, pencil, and a notebook. The instructions are easy to follow and each page is set up to explore different parts of the story and build on reading skills. Teen really loved setting up her book and making it her own. They will explore the story by thinking about the characters and their actions while writing their answers. They also have different definitions to learn and questions to make them think about why things happened the way they did. Each book also comes with an Answer Key so you can make sure they answered them correctly. All in all, it’s a great way to keep up a notebook with their work and keep them on track with reading and writing in their journals. The Interactive Notebook Book Studies are a really nice addition as well as the high quality teaching videos and read a longs. It’s a welcome addition to our daily schedule to keep track of our daily reading and encourage digging a little deeper into those books.